Martha Berry responds to Judge McGaughy's request for a 12 year old boy's entrance into the Berry schools. Although she cannot take him at such a young age, she asks for him to recommend the boy when he is old enough. 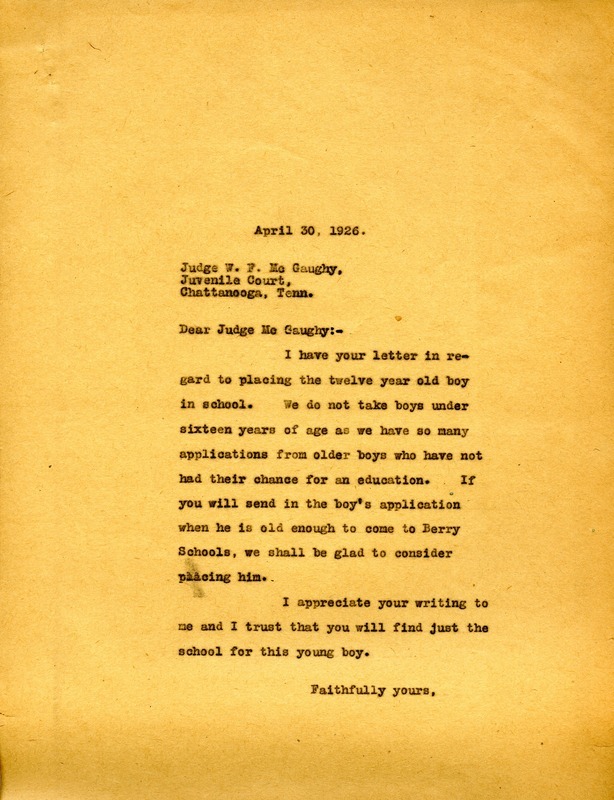 Martha Berry, “Letter to Judge W. F. McGaughy from Martha Berry.” Martha Berry Digital Archive. Eds. Schlitz, Stephanie A., Meg Ratliff, et al. Mount Berry: Berry College, 2012. accessed April 22, 2019, https://mbda.berry.edu/items/show/2076.